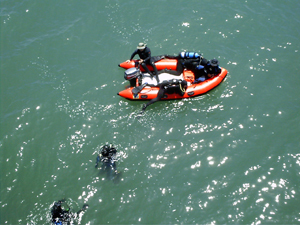 What are some of the specialty tools used in Underwater Search and Rescue? Six Foot Buddy Line: Used to keep buddy teams together in low visibility. Ringed Search Line: Used for low visibility circular searches. Line between rings works out to be length of an arm sweep. Wrist Bungee with Snap: Used to clip in to a line on a straight line search. Enables diver stay on a line hands free and to disengage when necessary. Double Ended Snap: Multipurpose- an indispensable part of a public safety diver's search gear. Mini Mother: Anchor point for circular search patterns. 100' Search Line: 1/4" polypro line, marked in ten foot increments, useful for a variety of search patterns. Perimeter Marker: Used as a place marker on circular search patterns. Area Marker: Used as a sign that area has been searched. Once deployed, Mini-Mother can be removed and used on new area. What Does The Gear Look Like?